First Steps @ FACT is 4/26 from 6-9pm and 4/27 from 9am-12pm. Take a next step to learn more about First Alliance Church Toccoa and get involved. During the weekend, you’ll discover what the C&MA is all about, how things work at FACT, and what it means to be “all in.” Childcare available upon request and meals (dinner on Friday and breakfast on Saturday) provided. 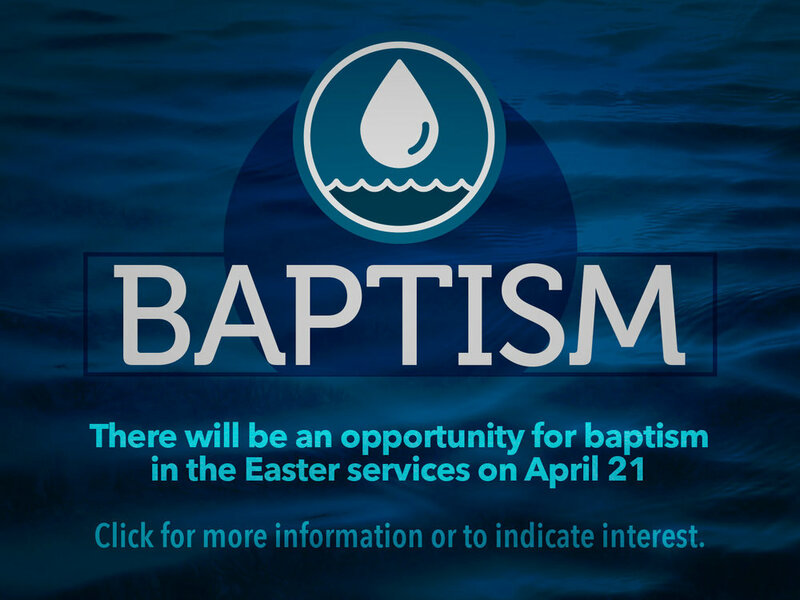 RSVP via a Next Steps Card on Sunday, or click here and complete the interest form..
Baptism will be a part of the Easter Sunday morning worship services on April 21. Baptism is a significant (and expected) moment in a disciple’s life of publicly declaring identity in Christ. If you would like to be baptized, click here to learn more and let us know you’re interested. 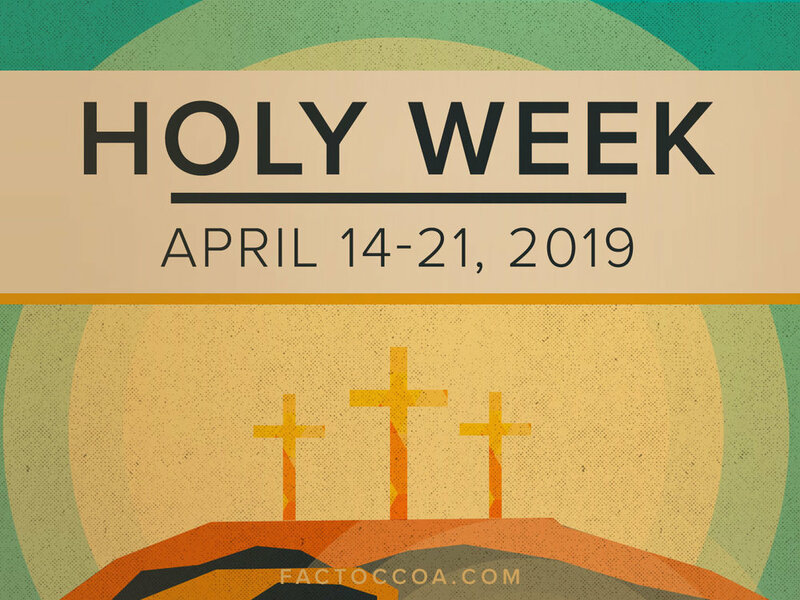 Holy Week Schedule as we remember Jesus’ death and celebrate His resurrection. We invite you to be part. Easter Sunday Worship Celebrations - 9am & 10:45am - with Coffee & Connection (and special snacks) in between. There will be NO Sunday School Communities or Sunday evening activities on Easter Sunday. Church Offices will be closed on Monday, April 22, in observance of Easter. Monthly Men’s Breakfast begins Saturday, 4/13 at 8am in the FLC Multi-Purpose Room. Come enjoy a tasty breakfast, get to know other men, and spend time in prayer and biblical fellowship on the second Saturday of the month. 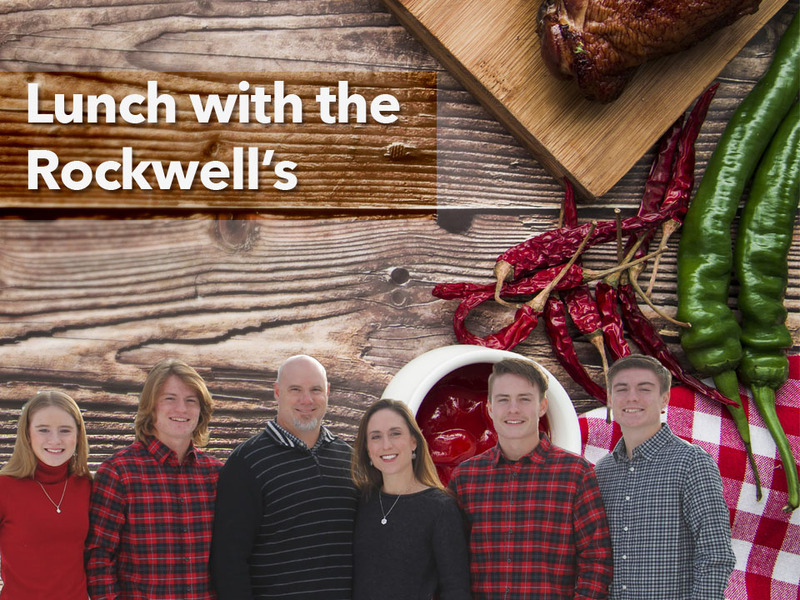 If you’re coming, mark B on a Next Steps Card or sign up with this form..
Have Lunch with the Rockwells on 3/31 at noon in the Family Life Center as we welcome them. The meal will be provided, so we need you to mark D on a Next Steps Card with the number coming and to also bring a dessert. Or complete the form below. Voluntary donations for the meal will go toward students going to PowerTime Camp this summer. 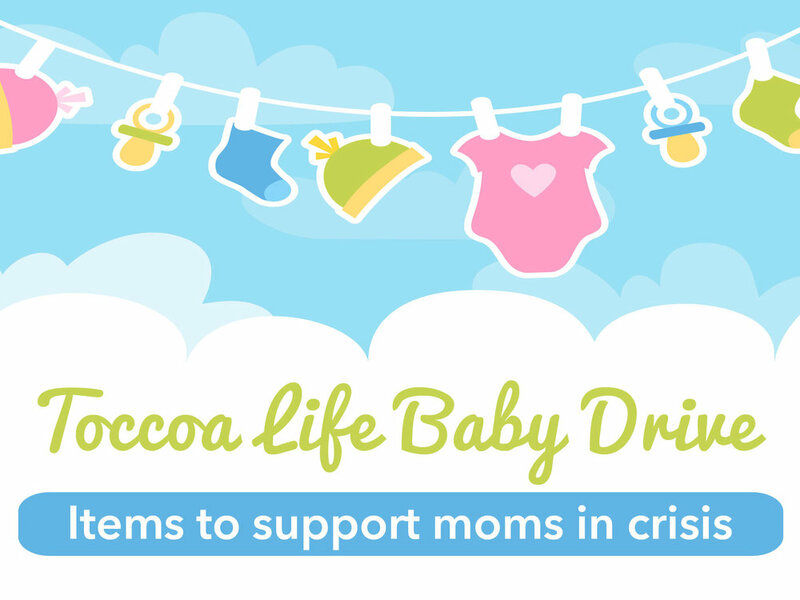 A Toccoa Life Drive is underway to collect items to assist mothers in crisis for the next 3 Sundays. Place wipes, diapers (up to size 5), and infant and children’s clothes up to size 5 (gently used, no stains) in the cradle outside the sanctuary. Helpful larger items include infant swings, bouncy seats, new car seats, and cribs. Thanks for helping this vital community ministry! The 2019 Spring Women’s Retreat is March 22 (4pm) through March 24 (noon) at Ridgecrest Conference Center outside of Asheville, North Carolina. This weekend is an opportunity to get away and reconnect with the Lord. Join with women from all over the South Atlantic District to experience more grace, beauty, and growth. Check out the details below, and then visit the Bulletin Board near the water fountain to sign up. A registration deposit of $50 is due by March 1 to secure your spot. Retreat is for two nights with five meals. (Rates below.) You may attend without an overnight; there is a minimum charge. We suggest that you signup with your church. Please make sure you have your name and preferred roommate(s) clearly written using the Room Signup Sheet provided. There is a non-refundable deposit of $50.00. If you make your own reservation, please call (800-588-7222). 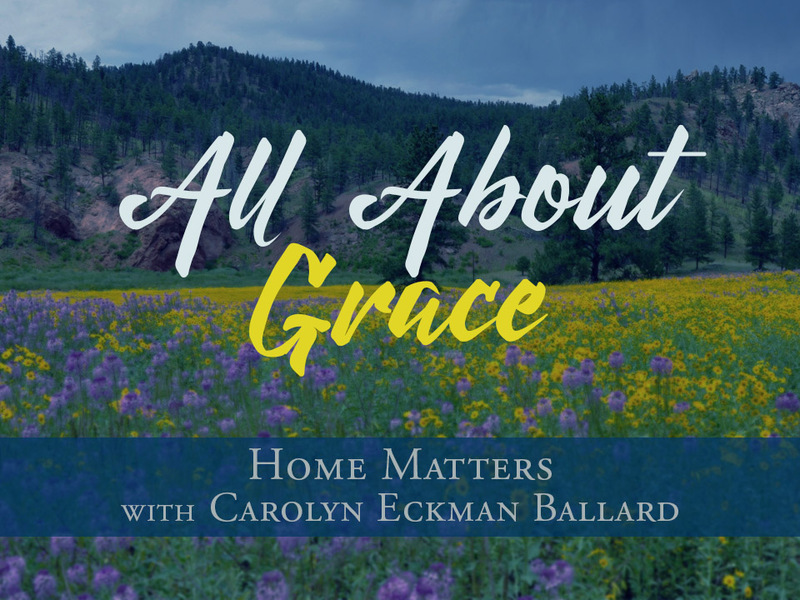 Heather Smith writes: Using the “only” Psalm as a springboard (you will have to wait until the retreat to find out which one it is) and some Old Testament characters as examples, this retreat is going to be extremely practical. Through Biblical teaching and interaction we will examine how biblical rest and refreshment may be different than we imagine, bring God into our pressures and prayers, and discover how we can live a powerful life of worship in the day to day. I can’t wait to be with you! You won’t want to miss this year’s messages! SILENT AUCTION is for the Outfit Fund. We ask for your lovely handcrafted items, paintings, antiques, gift baskets, handmade greeting cards, handmade clothing items, etc. 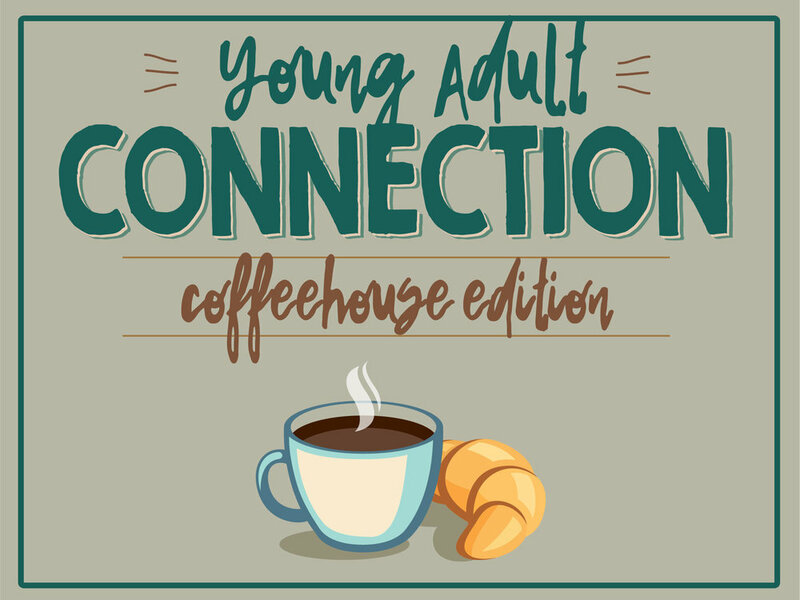 FREE TIME Saturday afternoon FOR ALL TO ENJOY – time alone, time with friends, time in nature, at the Cloud Coffee Shop (on campus) and/or shopping in local nearby stores. Further clarification: a mother with 2 children will be charged $273.00 for her room, but if another mother or adult is in the room with them, each adult in the room will be charged $174.00. Youth under 18 have no room charge. An Evening of Prayer will be held on Sunday, 3/17, at 6pm in the Sanctuary. All are invited to come for a time of worship, prayer, and listening before the Lord together. We will be focusing prayer on how God is positioning us to engage our local community, region, and world in dependence on the Holy Spirit, in unity with Christ, and with faith-filled obedience. 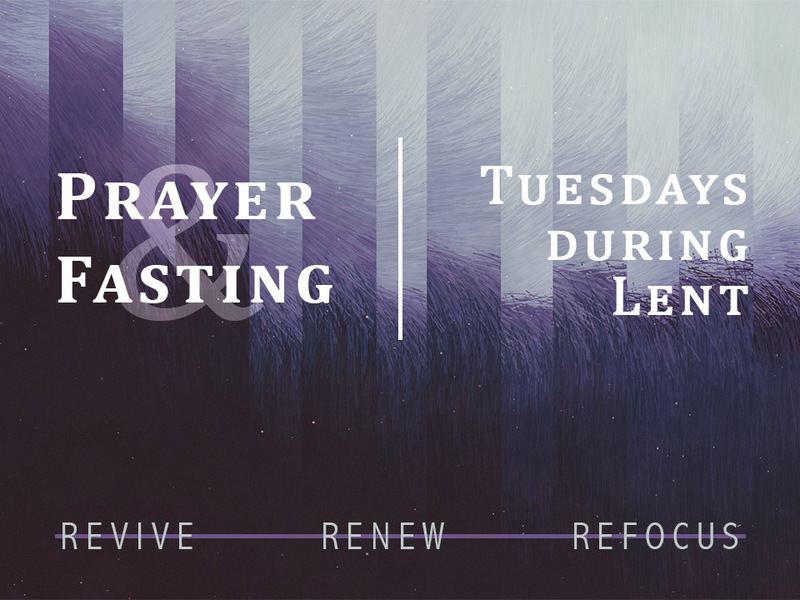 During the season of Lent, we are designating Tuesdays as a day of prayer and fasting. We invite your for forego your mid-day meal and spend time on Tuesdays in prayer for the revival of our passion for Jesus as disciples and the Spirit’s renewal of our church, community, region, and nation. It’s not about our own ability or righteousness, but God’s grace in freeing us to refocus on Him. The church Prayer Room will be available throughout the day for you to come and pray. Daylight Savings Time begins next weekend. Set your clocks (if it doesn’t happen automatically) forward one hour when you go to bed. Service will start at the normal time of 9am, although your mind and body will think it's earlier. Lent is the 40-day period that begins on Ash Wednesday (3/6) and concludes on Holy Saturday (4/20). It has been a time for reflection and renewal by Christians for centuries in preparation for Easter. Through repenting, praying, fasting, giving, and serving others, we draw closer to Christ by identifying with His journey to the cross and remembering the ultimate expression of love. “It is a time of returning to God” (Henri Nouwen). This year, seek God with all your heart and experience renewal. Learn more and find resources here. This year's annual Family Festival of Nations is February 24 - March 3, 2019. It's a full week of celebrating what God is doing around the world, hearing how God is using the skills of people just like you and me to awaken peoples to the saving grace of Jesus Christ, and discovering ways we can be part of the Great Commission. Have you awoken to what it means to live in His Kingdom now so that this Kingdom will come in fullness when He returns? It means that we wake up to the reality of the kingdom of God and the tension that exists between the now and not yet. The Kingdom that Jesus promised (that we read about in the Scriptures) is a Kingdom that is eternal, but hasn’t fully happened yet. Jesus is at work in these days and wants us to join him. This idea is rooted in Matthew 24:14 and is what first “awakened” the movement known as the Christian & Missionary Alliance. It means we wake up to kingdom living which, based off of Matthew 24 and 25, means a call to always be ready by living in love with and anticipating the Coming King (Matthew 24:42-25, 25:1-13), always be investing what He has put into your hands into those things that will be eternal (Matthew 24:45-47, 25:14-29), and always be serving because the Kingdom is love and people are precious (Matthew 24:48-51, 25:31-46). You're invited to be part of this year's Family Festival of Nations. There's lots of ways to participate. Check it out below, and we hope you will choose to live purposefully for the sake of Jesus. This year's special project is raising money to purchase supplies for Adventure Camps in Uruguay, South America. Outdoor Adventure Camp is dedicated to providing outdoor adventure experiences in English for youth ages 12 to 18 years old and give them the opportunity to explore the natural beauty of Uruguay. The students get diverse, creative and practical opportunities to learn and practice the English language through activities that teach youth to grow in the following areas: Leadership Development, Problem Solving Skills, Healthy Self-Esteem and Team Dynamics. Each of these skills are valuable assets to become a better well rounded successful citizens. Each camp lasts about a week and can include activities such as kayaking, canoeing, rock climbing or a bouldering gym, hiking, group dynamic games, backpacking, and overnight camping. Most students do not have access to the resources necessary to do these types of activities . Resources that these funds will go toward include tents, sleeping pads, camping/cooking supplies, and rock climbing equipment (harnesses, helmets, ropes, carabiners, and other necessary equipment). Be part of this project by placing coins, dollars, or checks in a collection can. They're available in the front foyer. Bring your cans back on Sunday, March 3 at 9am where we will collect them as part of the Closing Celebration of Family Festival of Nations week. Please use the form below to make reservations so we can be adequately prepared. There will be peanut butter and jelly available each evening for the "picky" eaters among us. On Saturday there will be a Men's Breakfast at Toccoa Falls College Dining Hall at 9am ($6.75/person inclusive) and a Women's Brunch at 9am in the Fellowship Hall at First Alliance. Parents are encouraged to bring their kids to both of these events. Babysitting will be provided for the Women's Brunch for infants and toddlers. Please use the form below to sign up for the Women's Brunch. *If possible, bring international fare! 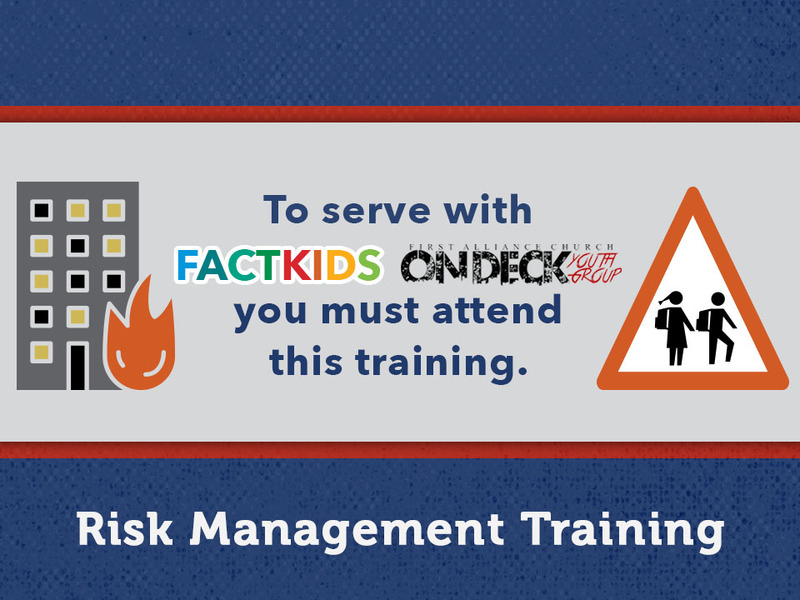 Risk Management Training will be offered on 2/17 at 10:45am in the Conference Room (located off the Sanctuary). Anyone interested in serving as part of a children or youth ministry team needs to attend. This training ensures safe environments for disciple-making at FACT. Please mark C on a Next Steps Card or contact the church office to let us know you’ll be attending. Pray Together as Ladies on Tuesday, 2/5 at 7pm in the Fellowship Hall. We will pray for our church, community, & world then share light refreshments as Great Commission Women. GriefShare is for those who need hope and encouragement after losing a loved one. The next 13-week group begins Tuesday, 1/22 at 6:30pm in the Library. Find support through video, group discussion, and a personal workbook, or encourage someone you know to participate. Click here to learn more and to register. “Story Telling” is a ministry that International Worker Marilyn has been involved with in West Africa. Women, come hear her share about it and the exciting results that are being seen on Tuesday, Jan. 8 at 7pm in the Fellowship Hall. Light refreshments will be served. Sponsored by GC Women. preach in the 9am service on Jan. 6.
share his personal testimony and answer questions at 6pm. After that, the congregation will have the opportunity to participate in a non-binding straw poll. Please be seeking the Lord between now and then for His direction for both FACT and the candidate. As a reminder, please do not post about the candidate on social media or contact him directly. If you need additional information about the candidate, information sheets are available from the church office. If you have questions, please speak directly with a member of the Search Committee. 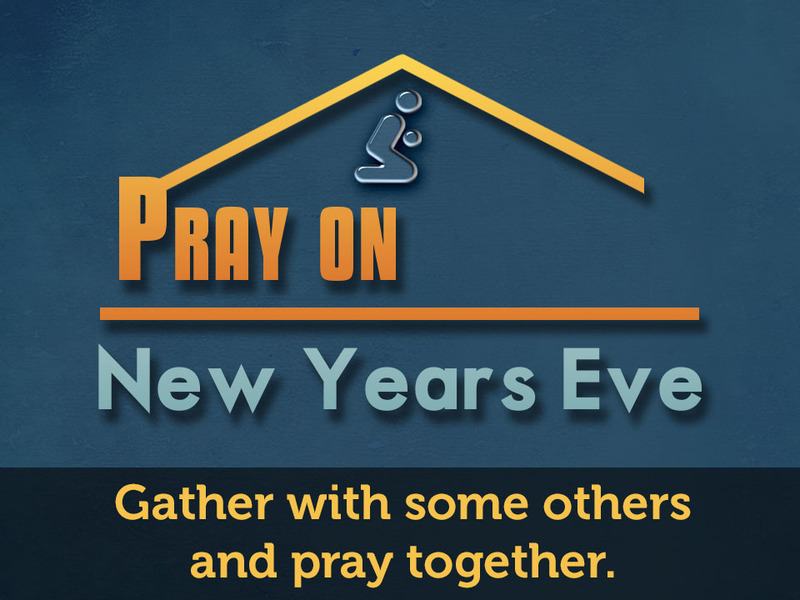 This New Year’s Eve take a few moments to pray for one another and our community as 2018 ends and 2019 begins. Whether you already have plans or choose to invite some people over, take a few moments to pray about what’s happened over the past year and what you’re looking ahead to. Pray for the people of FACT, our community, and the world to know, love, and follow Jesus fully in 2019. End of Year Giving Deadline is 12/31. 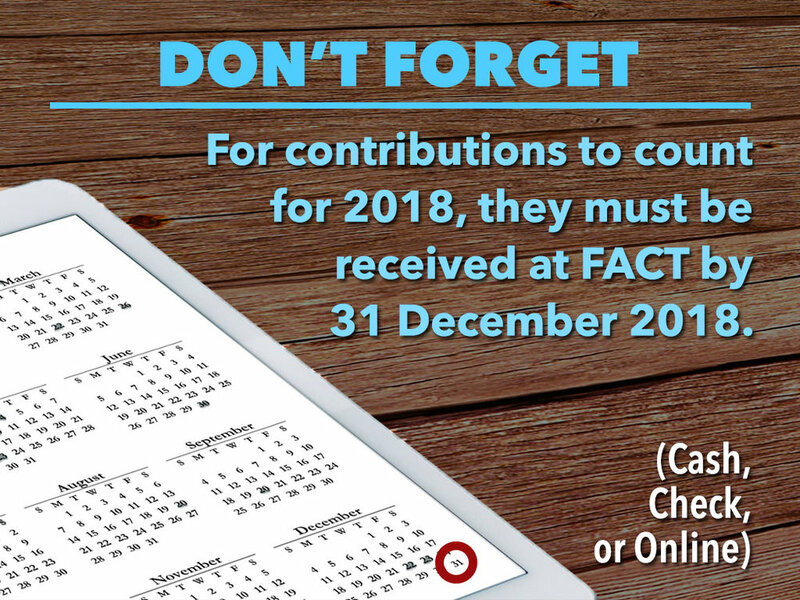 All offerings, whether physical or digital, must be given or dropped off before the end of the day to count toward 2018 giving. Thank you for your consistent generosity and stewardship. The Community Candlelight Christmas Eve Service is Dec. 24 at 6pm for all ages. Celebrate Christ’s birth through music, scripture, and candlelight as a family. Come and remember what Christmas is all about. The good news of Jesus is that God is with us always. Church Offices Close at Noon on 12/24 and are Closed on 12/25 and 1/1. Awana Store Night is Wed. 12/19 to bless & encourage hard-working Clubbers. You can help by donating small & big items like puzzles, games, balls, books, crayons, toys, etc. or even a bike. Items can be dropped at the Awana Office on Wednesdays in the FLC or left at the main office during the week. Thanks for your generosity! Caroling and Chili Cook-off is Sunday, 12/16. Meet in the Fellowship Hall at 5pm with your entry because we’re looking for the best chili, the best soup, and the best overall for the Golden Ladle award. Bring some crackers/bread/veggies to share if chili/soup isn’t your thing. Everyone bring a favorite Christmas treat to share. We’ll sing carols for our community and pass out candy first and then enjoy soup and chili back in the Fellowship Hall. For the whole family. 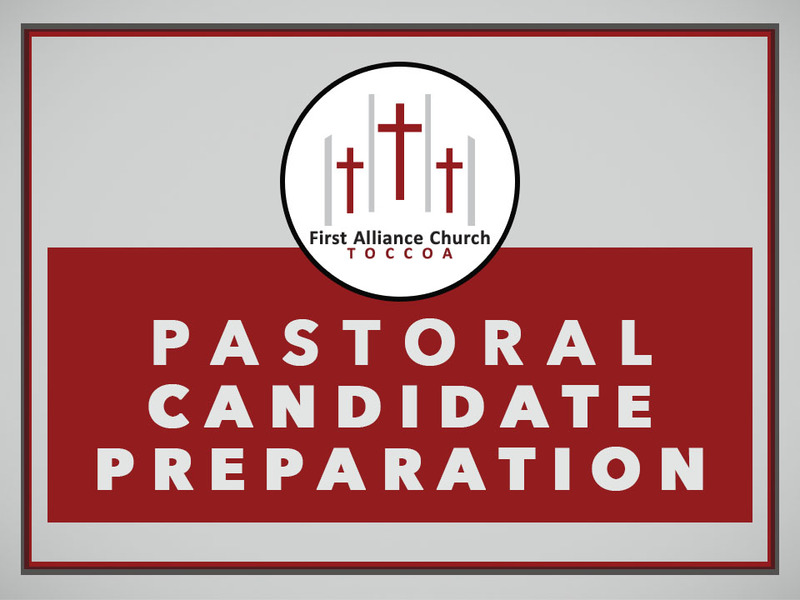 In Preparation for the Pastoral Candidate coming Jan. 5-7, there will be a meeting on 12/16 at 10:45am in the Sanctuary in lieu of Sunday School. Hear from the Search Committee about why they believe this is the candidate God has for FACT, how he aligns with the profile that was developed over the summer, and spend time in prayer together. All are encouraged to come. Children up to 5th grade will be cared for. After the meal, you’re invite to stay and help prepare candy bags to be handed out as part of caroling on Dec. 16. A Special Year End Offering will be received on Sunday, 12/9 to help send 60 new Alliance workers to parts of the world where God has opened doors for the Gospel. They are ready to go engage the world, many to places that have never had a viable gospel presence, yet the funds are not available because there are more than planned for and GCF giving is below expectations. John Stumbo, in his video blog this month, says this, “The God of this universe cares about the people of this planet, raises up people to be His spokespersons, and some of us have been called to be the senders. Let’s rise to that at this moment.” Take 12 minutes to watch as John shares about the challenge and opportunity and pray about how the Lord will have you get involved beyond your regular giving. Will you give a special above & beyond sacrificial gift in honor of Christ’s birthday and be part of completing the Great Commission?